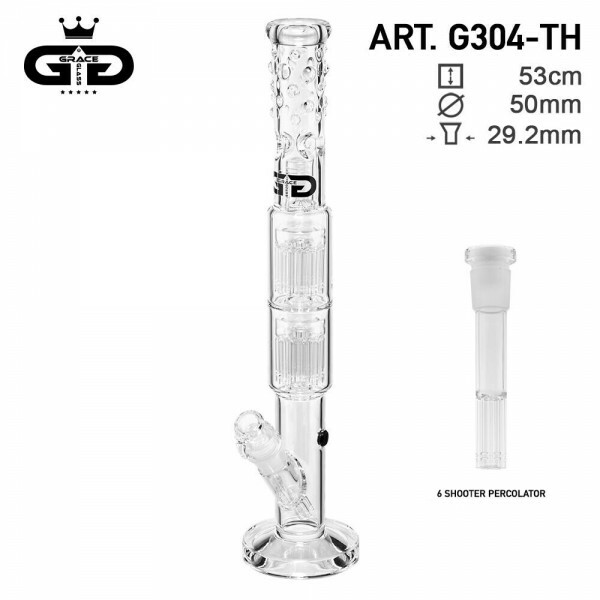 This crystal Cane Grace Glass bong will provide you with an advanced smoking experience! It is made of a sturdy heat resistant borosilicate glass, formed in the shape of a cane tube. You can place your precious herbs or tobacco onto the detachable transparent bowl, coming with a handle, for easily lifting it up and cleaning it at your convenience. The bong connects to a detachable chillum through a sure ground of 18.8mm diameter. A 2x12 Arm percolator bubbles up your smoke, smoothing your toke. What' s more, a splashguard in the shape of a dome prevents water from splashing into your mouth, while some ice noches can hold a few cubes, for cooling your smoke, and a kickhole with a rubber carb stopper offers you the option of a different pull angle! With the black Grace Glass logo featuring at the bottom of the tube, the whole set-up ends up in a mouthpiece ring covered by some beautifully shaped glass beads.